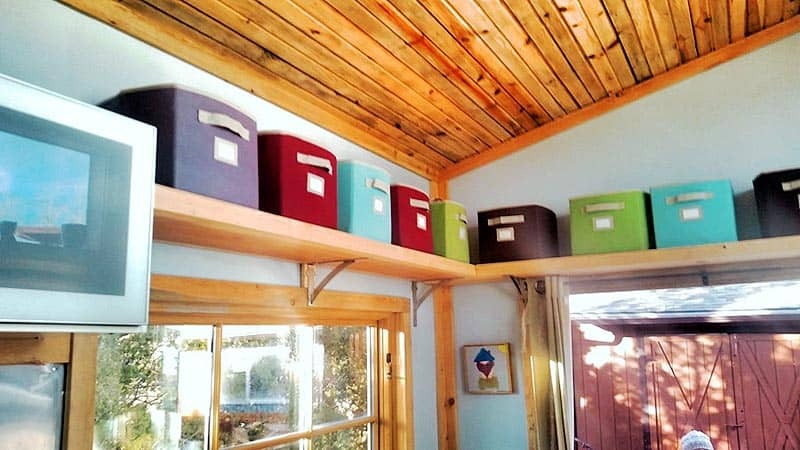 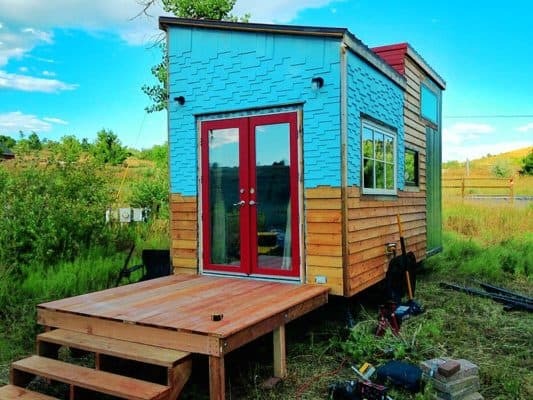 We love seeing unusual designs, patterns, and storage ideas, all of which this tiny house made by Sustainable Arbor Works displays. 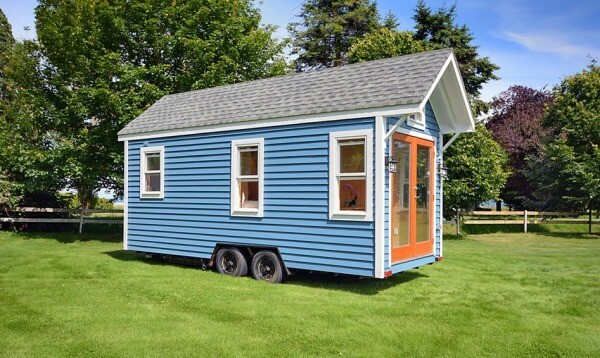 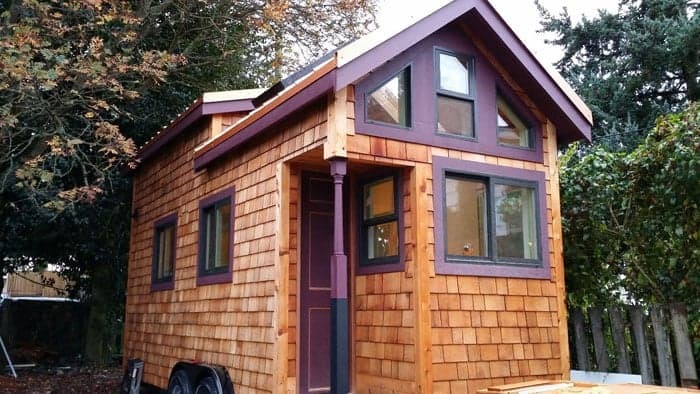 Part of the allure of a tiny house comes from the ability to create something unique, a true expression of personality and principles, both of which this design succeeds in doing. 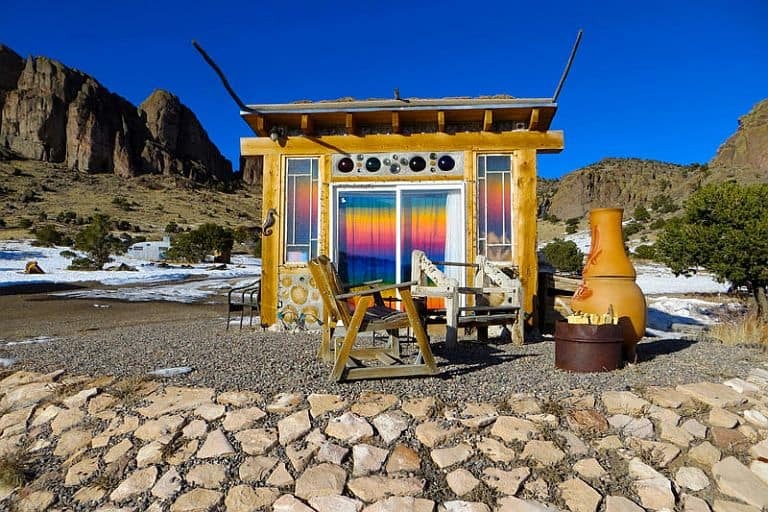 The first thing you notice is the exterior, with its juxtaposition of color, material, and patterns that makes for a pleasing, albeit different aesthetic. 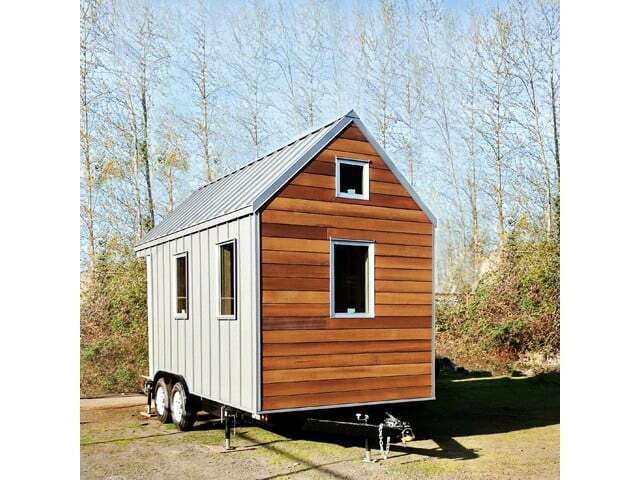 The bright blue color and staggered shingle arrangement pairs well with the natural pine and corrugated aluminum. 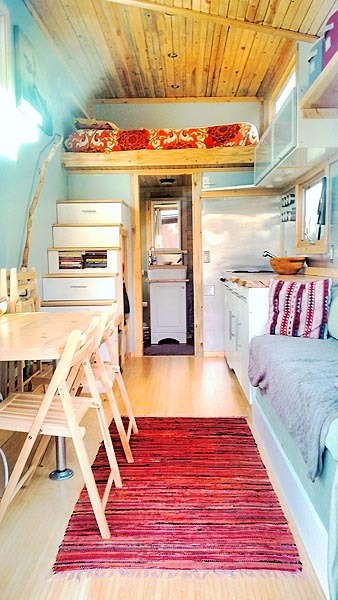 The interior design features an equally impressive amount of detail and craftsmanship. The loft sleeping area fits a king-size bed and includes built in shelving and outlets. 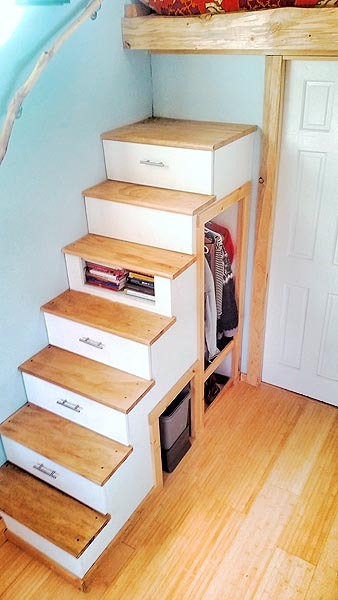 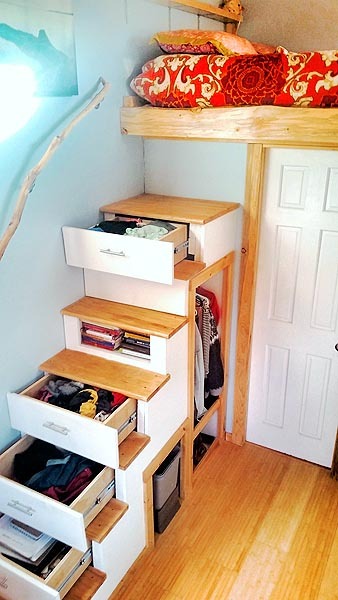 The stairs leading up to the loft double as storage and even include built in drawers for extra hiding space – a design element we absolutely love. 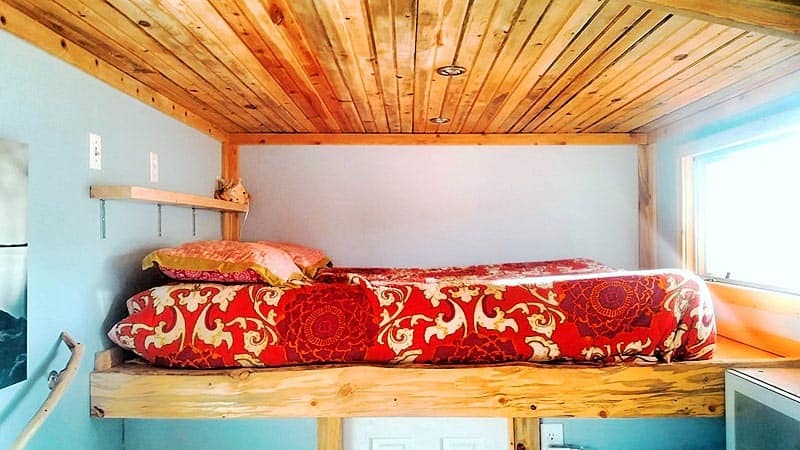 Beautiful reclaimed and sustainable wood accents define the small space, with floors made of bamboo and cork and walls made of beetle kill pine, an eco-friendly and exotic looking pine that’s native to Colorado. 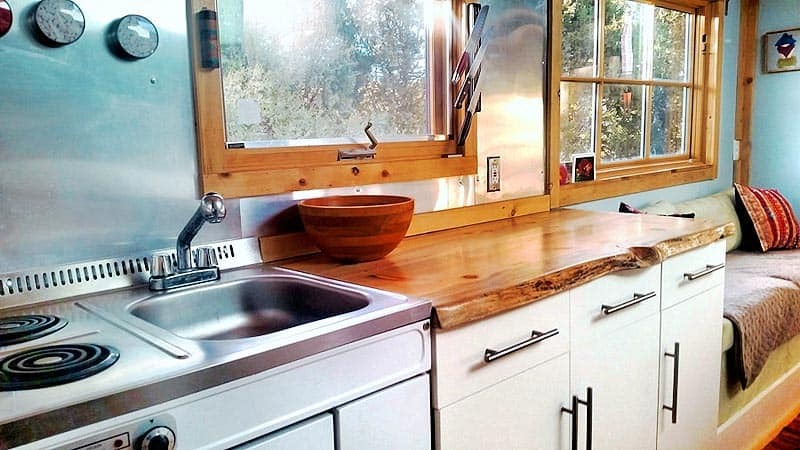 We love the “live edge” kitchen counter, made from a slab of beetle kill wood, polished and stained to a glossy perfection. 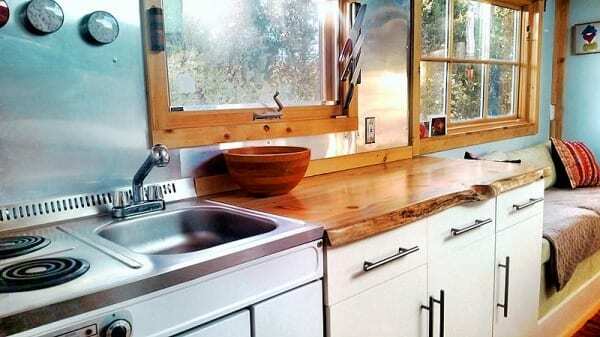 The kitchen includes all the basic necessities, from the two-burner stove to a kitchenaid convection oven and cabinets to store plates and utensils. 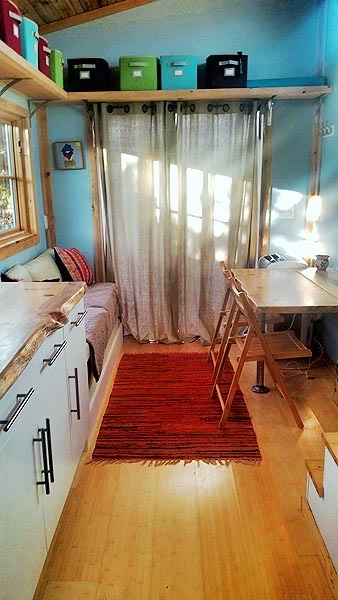 A fold down table offers ample dining space, or a place to do some work while a couch designed by local renewable furniture company Home Reserve provides a relaxing area to unwind, with extra storage under the cushions. Dog and cat owners will be happy to know it was made using pet-proof fabric that’s stain resistant. 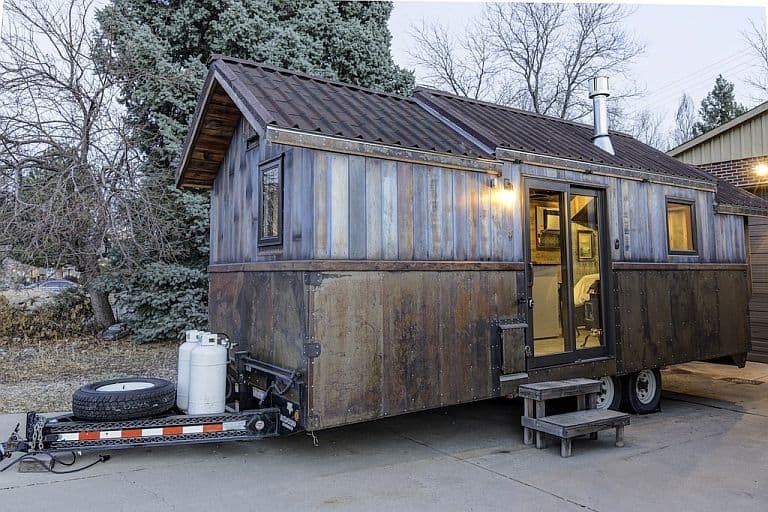 Despite the small 170-square-foot footprint, the bathroom feels surprisingly large and includes a full shower, custom vanity and a toilet that can be hooked up to a septic system. 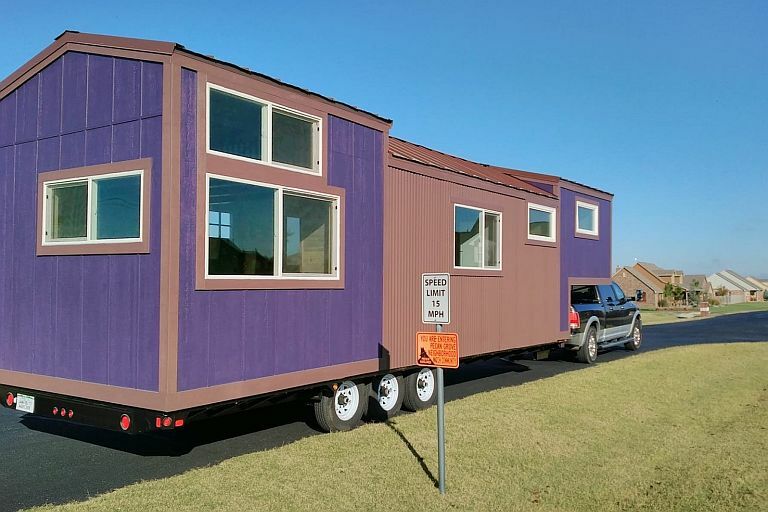 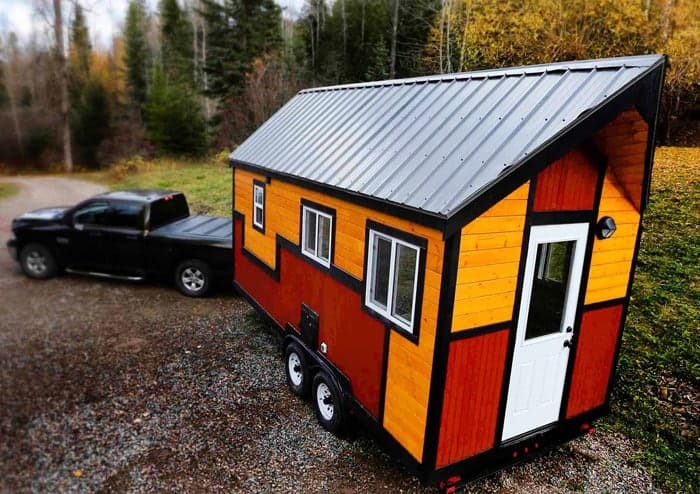 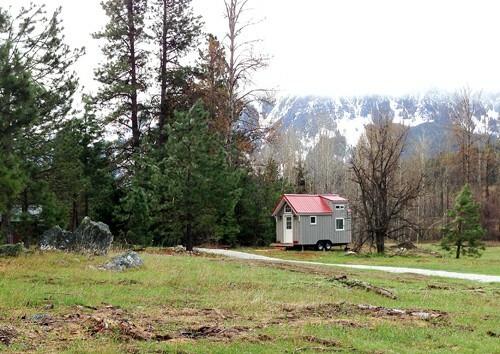 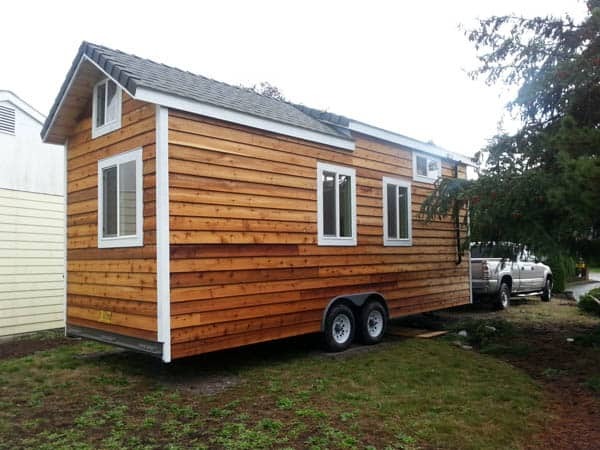 At 8,000 pounds the tiny home on wheels can easily be towed wherever you want, without any special permit. 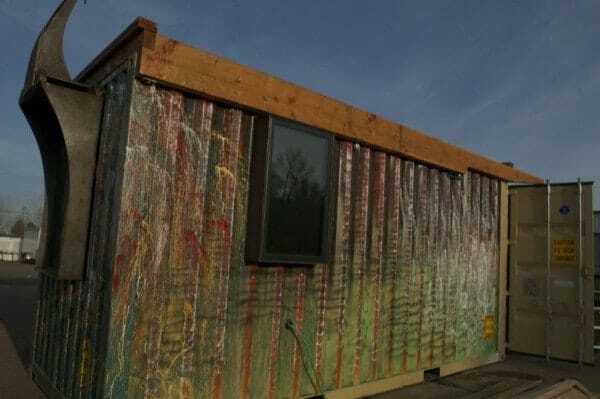 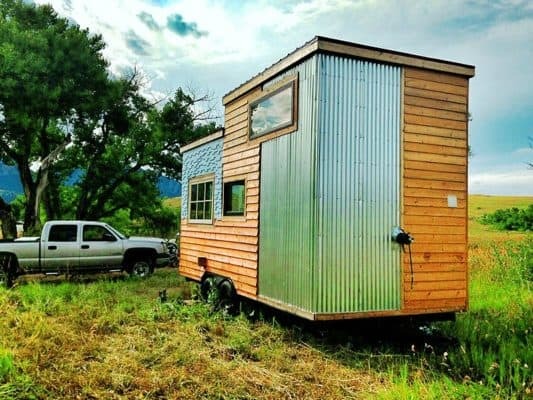 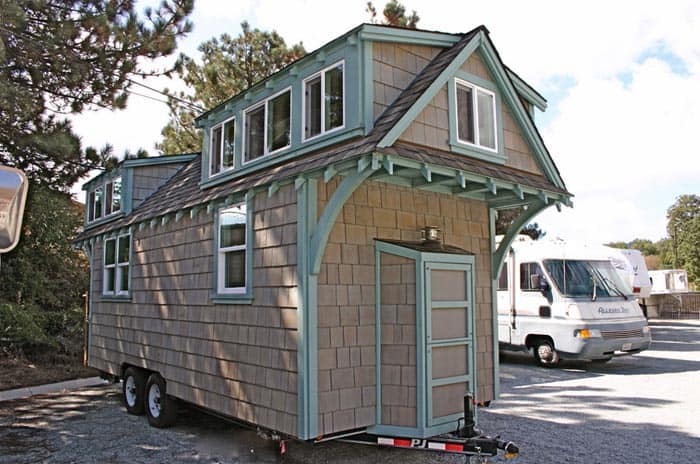 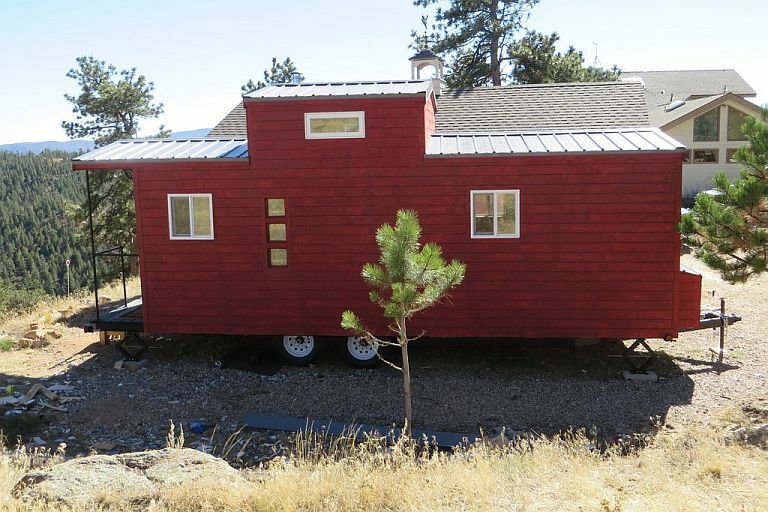 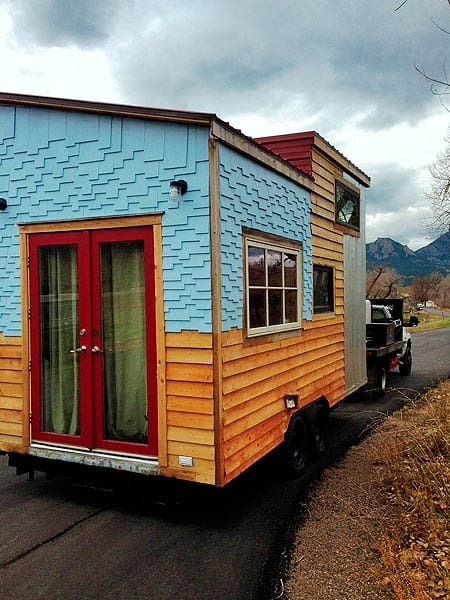 You can learn more the Boulder, Colorado, builder and inquire about this tiny house at their website.